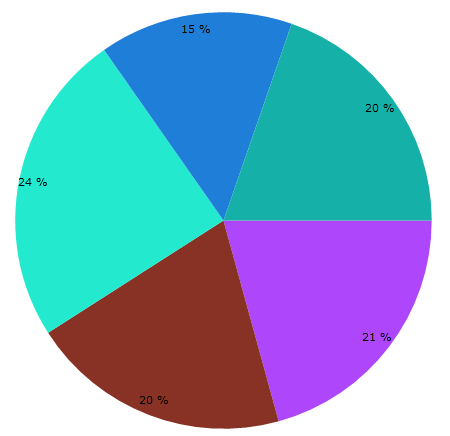 This topic demonstrates how to create charts, where each individual item, has its color bound to a property of the underlying data object. There are small differences in the approaches used with the different series types. For the sake of the example the following series will be used. They cover the possible approaches. 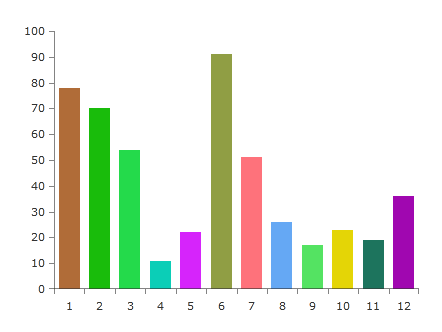 Here is a sample bar chart defined in Xaml. You can see the data model used for this example in the Example Data Model Definition section. There are couple approaches which could be used to bind the color from the data object to the fill of the data point visual (the bar). Use the DefaultVisualStyle property of the series. You can use this to target the default visual of the series and bind its properties to the data model object. 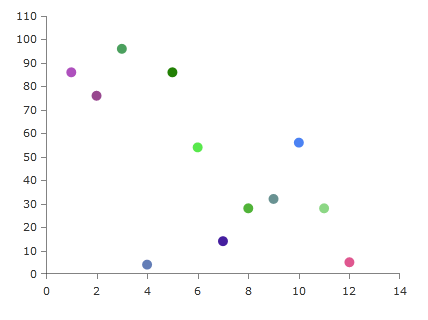 Using the data model from this article's example you can bind the Color property from the ChartData class. Use the PointTemplate property of the series. In this case you can define a DataTemplate containing a custom visual element for the data points and bind its color property (Background or Fill for example) to the property from the data model. The DataItem in the binding's path points to the custom ChartData model. The recommended approach for binding the color is to use the DefaultVisualStyle. This is because the PointTemplate creates an additional ContentPresenter for each data point visual which means a bit more rendering time for the framework. You can use those approaches with most series types of the chart. The ScatterPointSeries can be customized using the same manner as with the BarSeries. There are two small differences which could be applied. When using DefaultVisualStyle you will need to target a different UI element - a Path in this case. And also you will need to define the size (Width and Height) of the Path. The data context passed in the DefaultVisualStyle of the ScatterPointSeries (and several other series) is not the DataPoint object, but the context of the series. In this case the DataPoint is stored in the Tag property of the Path. When using PointTemplate the most common shape you will use is an ellipse so you can define an Ellipse element in the template. Similar to the BarSeries the PieSeries uses a default visual style to customize the appearance of the pie slices. The Style should target a Path element and it is applied to the DefaultSliceStyle property of the series. This section contains the data model used for the series examples in this article and also how to set it up. Let's create some data so we can test the result.